Die meisten Regierungen in den arabischen Ländern haben die Abfallwirtschaftsprobleme erkannt. Es gibt den Trend die lokale und internationale Privatwirtschaft stärker zu integrieren. Die Sammlung und der Transport der Abfälle werden durch kommunale bzw. Privatunternehmen realisiert. Die Verwaltungsinstitutionen und die lokale Privatwirtschaft verfügen nicht über die notwendigen Praxiserfahrungen bei der Umsetzung und Realisierung einer nachhaltigen Abfallwirtschaft. Der Bedarf bei der Behandlung, Verwertung und Deponierung ist noch sehr groß und es wird dringend nach angepassten und geeigneten Lösungen gesucht. Nur durch die Reformierung der lokalen Rahmenbedingungen, Investitionen in Pilotprojekten und Gewinnung von internationalem Know-how kann die Abfallwirtschaft umweltgerecht und nachhaltig aufgebaut werden. 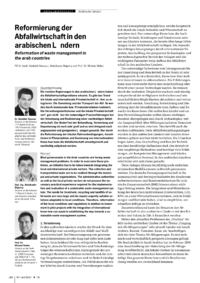 Most governments in the Arab countries are facing waste management problems. In order to overcome these problems, an initiative has to be taken towards integrating the local and international private sectors. The collection and transportation tasks are to be realised through the municipal and private organisations. The administrative authorities as well as the local private sectors do not possess the necessary practical experience required for the implementation and realisation of a sustainable waste management system. The needs for treatment, recycling and landfills of solid waste are very large and do require urgently suitable solutions adaptable to local conditions. Therefore, reformation of the local conditions and regulations in addition to investment in pilot projects with the integration of international know-how can assist in establishing the way towards a sustainable waste management system.